We are pleased to announce a new 12-week group, in partnership with OTR. 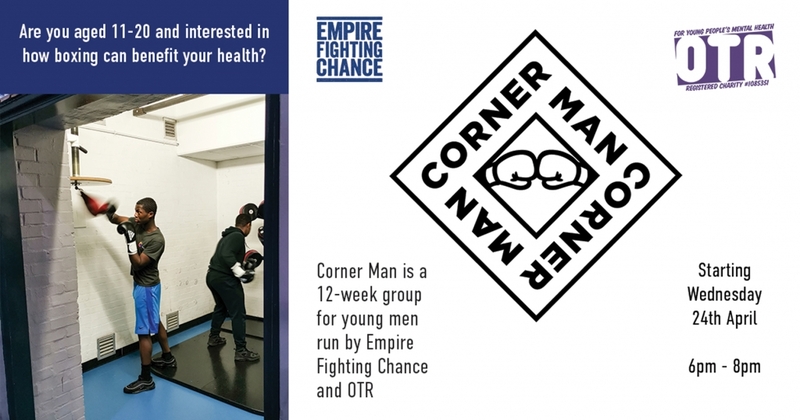 Focusing on one hour of boxing with one hour of group conversation, Corner Man will provide a supportive and safe space for young men to express themselves, within a disciplined but fun boxing environment. Come in for our drop in session on Wednesday 3rd April before 1/2 term. Register by calling 0117 908 6655 or email our Operations Manager Dan for more information. Empire Fighting Chance is a charity and a company limited by guarantee registered in England and Wales Charity No. 1156690 Company No. 8752389. Registered office: The Mill, Lower Ashley Road, Easton, Bristol, BS5 0YJ.